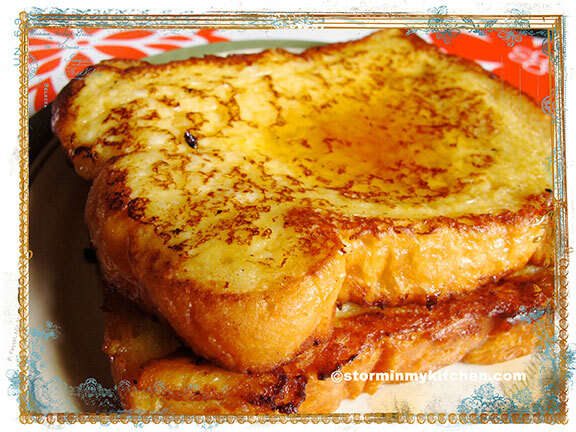 I read somewhere that when you have old bread, make French toast. I was away for Easter break. We hopped around the nearby islands, feasted on wonderful food but for the most part, it was lounging at the beach or on a hammock near our cottage with a good book… a perfect getaway from the busy schedule. A much needed rest, truth to tell. I hope yours was as restful as mine. So I come home and there it was on the fridge, pitifully staring back at me. “French Toast time”, my thought balloon goes. 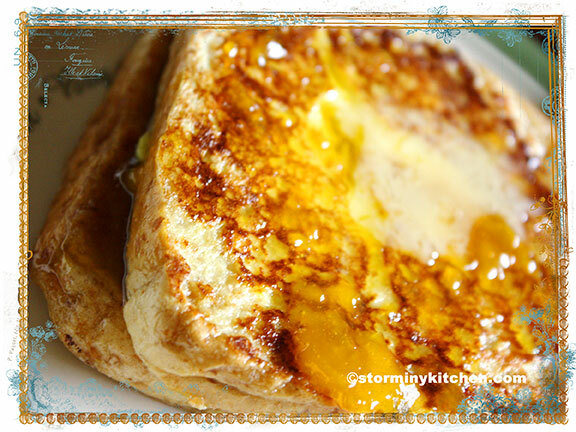 Not that I wait for bread to go stale but days old bread make a lovely French Toast. I like mine a bit crisp on the edges but still soft and creamy in the middle. The trick is let the bread soak for a minute or 2 and cook it with a fair amount of hot oil. Adding sugar to the mixture will crisp up those edges. I like using thickly sliced loaf breads. I am currently loving the Premium Bread from BreadTalk but baguette or Jipan’s Monroe bread works well too. Adapted from Molly Wizenberg’s book, A Homemade Life, Burg’s French Toast is by far, the best French Toast I had ever made. So addictive I have become, I find every opportunity to make them. Served hot with butter and Maple syrup – what a way to start the day. On occasion, I’d sub the maple with fruit jams. Equally as heavenly. You are currently viewing the archives for April, 2012 at Storm In My Kitchen.